Whether you are in Buenos Aires for a day because it is a one-day port of call or on a layover, it can be a challenge to get a sense of the locale’s people and personality. However, my husband, Bill and I did our best to take in the flavor of the city during a recent South American cruise. Deciding the best things to do in Buenos Aires for a layover can be hard, only because there are so many options. 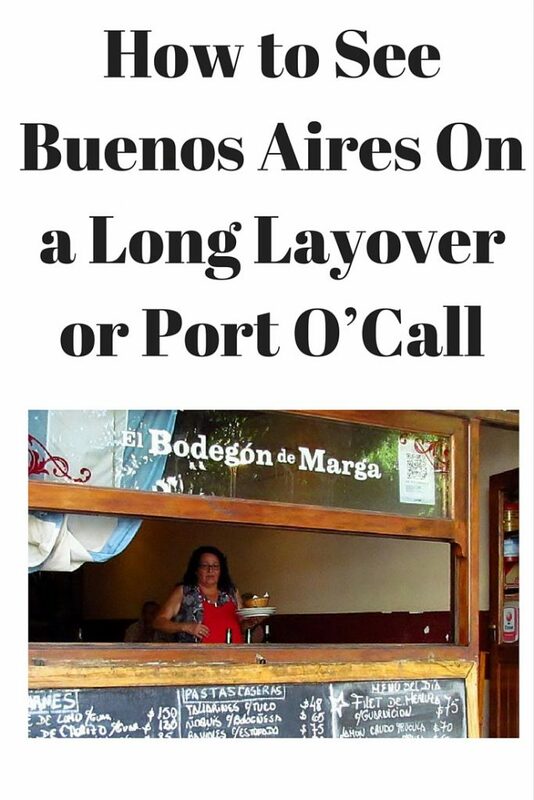 In advance of our trip, I had done as I always do and researched Bueno Aires. Despite doing the homework, I typically do not like to over plan. Buenos Aires is a big city and we knew we could not do it all in a day. However, there were a few things we knew we wanted to do including a three-hour walking tour with Context Travel; a steak at a neighborhood restaurant and take in some tango music and dancers in colorful La Boca. 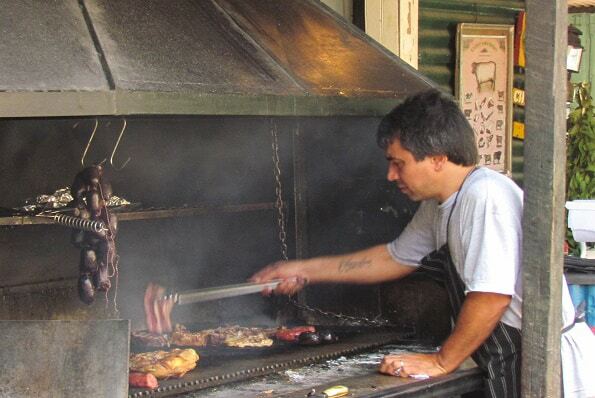 We scheduled a modified version of Context Travel’s 3-hour Making of Argentina tour. Because I was not aware of the distance between the cruise port and our meeting point at the Puerto Madero, we were a bit late for the tour. Our docent, Salome was flexible and adjusted the itinerary to accommodate our tardiness. We promptly began our tour upon our arrival. 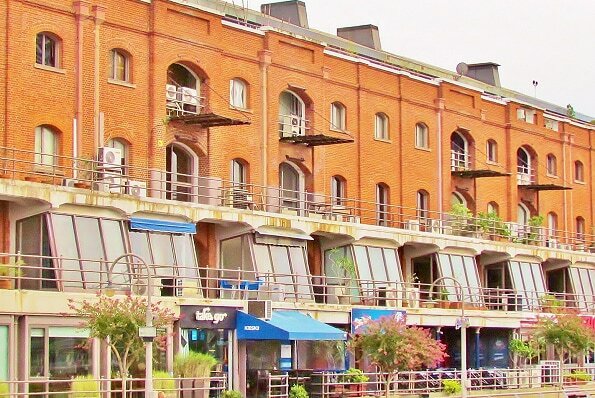 Starting in the trendy Puerto Madero area, Salome explained to us that this was the original port in Argentina. After the new port was built the original ceased to function and the area fell into disrepair. In recent years, it has undergone revitalization. You can still see what was of the original port. Remnants of some of the cranes that once dollied up and down the steel tracks transferring cargo from ship to warehouses still exist. The old industrial buildings are now multi-use space with retail shops, restaurants, offices, and apartments all residing under one roof. This has become a gathering spot for locals and tourists alike. 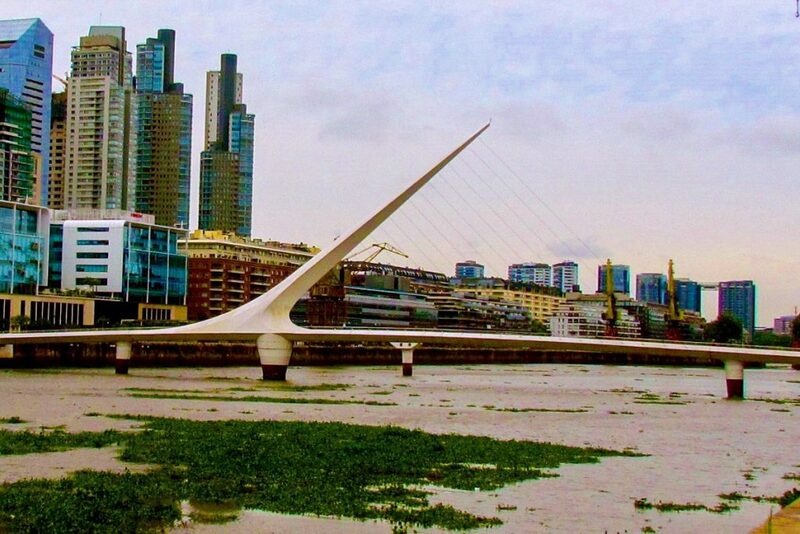 The Puente de la Mujer (Bridge of the Woman) connects the Puerto Madero with the new city. This is an affluent section popular with young business people. The area is predominantly newer apartment buildings, hotels, restaurants, and offices. There is also a protected reserve. 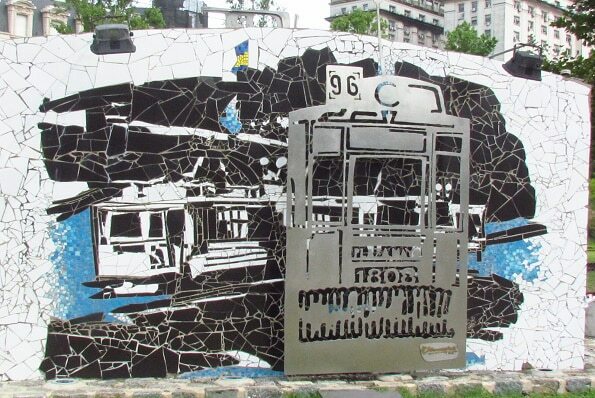 We did not get over to that part of the city as our tour concentrated on the history of Buenos Aires. Nevertheless, the region is worth noting and is a place we would explore on a repeat visit when we have a bit longer. You may choose to do it during your daytrip. It is no coincidence that Buenos Aires is sometimes referred to as the “Paris of South America. “ This was by design. The Argentine founders courted light skinned Europeans of art, music, and literature to immigrate to Buenos Aires. With them, they brought, European food and culture. However, like the United States, this meant that the indigenous people were pushed out. Because of the influx of European immigrants, Buenos Aires has a notable Old World feel. This is present in much of the architecture, both new and old. And of course, the city is known for its art, music, dance and opera houses. With the importance of immigration on present-day Argentina it is only logical that our first stop in the old city was the original Immigration’s Office. The building is one of the few colonial-style buildings left in Buenos Aires. To show us the difference in architectural styles we walked a short distance to a newer more European influenced Immigration Building. In the downtown area, much of the architecture, particularly government buildings, are constructed in this style. As we moved on and into the city we stopped at the Defense Building. Naturally, the conversation turned to politics and government. We learned that Argentina had fought for centuries before gaining its independence from Spain in 1816 and becoming a Democracy only as recently as 1983. After a few more stops, we made our way to the Casa Rosado (Pink House) and Plaza de Mayo. This is the equivalent of the White House in the U.S. or the Presidential Palace in many other countries. This is where Eva Peron would have given her speech to the masses, as seen in the film Evita and one of the most popular things to do in Buenos Aires. 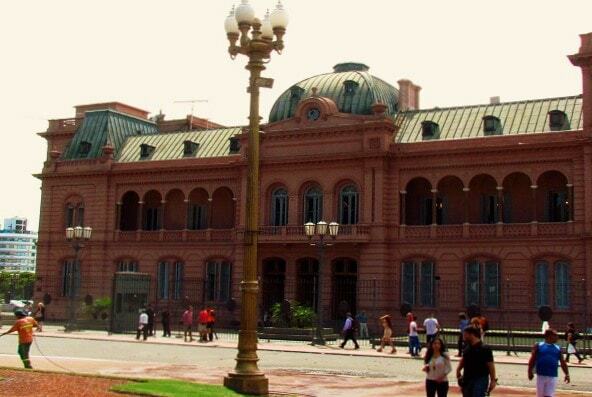 Casa Rosado was originally two buildings: the Presidential Palace and the post office. Oddly, the grander of the two was the post office. This did not sit well so the two building were attached to make one Palace. The Palace overlooks the Plaza de Mayo, which is the city center. This is where the Argentine people come to protest and celebrate. This is true even today. 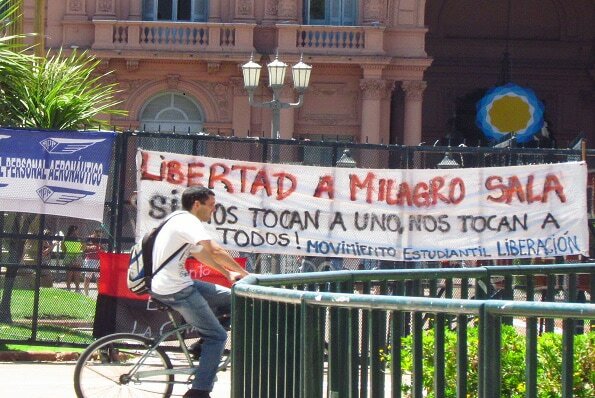 The day we were there, a small group gathered to protest the imprisonment of Milagro Sala, a human rights activist. Probably the most fascinating part of the tour was right here in Plaza de Mayo. In the center of the square is an obelisk, a monument to Argentina’s freedom on May 8, 1816. There is a paved area that circles the monument. From the ring are “spokes.” The inner spokes have white headscarves painted. The paintings represent the Abuelas (Grandmother’s) Movement. Beginning in 1976, dissenters of the dictatorship began to disappear, approximately, 30,000 in total. The mothers and wives of the missing men, being unable to protest under the dictatorship, began to walk quietly around the monument. The younger women, many pregnant prior to their husbands’ capture were then jailed themselves. When the women gave birth, their children were taken and “adopted” by the wealthy families and couples aligned with the regime. Years later the same women, then grandmothers, protested and became human rights activists. Their mission was to get the word out to people born between 1976 and 1983 that the people they knew as their mother and father may not be their biological parents. They have had some success in finding the children taken at that time. Because of our tardiness for our tour, we needed to cut it short. Normally, our docent would have taken us into the San Telmo neighborhood. Before parting ways, she suggested we walk through the neighborhood. We did but by this point, we had lunch on our mind so we did not spend a lot of time there. We came across several cafes along the way but feared they may be a bit touristy. 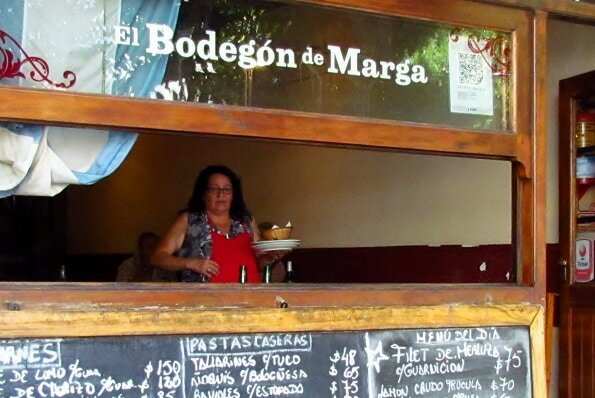 We continued to walk a few more blocks and stumbled upon a neighborhood steak joint, El Bodegon de Marga, (Indepencia Av. 371, San Telmo). We knew we were in the right place. Outside a chalkboard displayed the menu, inside was reminiscent of a pizza or sub shop in the U.S. In the back was a counter where the cook took orders from the waitstaff. There were tables and booths and a few business people sitting having lunch and chatting with the server. We stepped in and were handed menus – all Spanish. The server spoke no English and we speak only a tiny bit of Spanish. I like to say I know enough Spanish to get me in trouble. With my limited Spanish, I could translate salad (ensalada) and beef (bife). We knew we wanted steak. When the server returned, we attempted to place our order. Bill pointed to his selection. Our server nodded and smiled. I pointed to mine. She shook her head and frowned then pointed to what I would be having. I nodded and went with it. I have to say I did the right thing. Always go with the house recommendation. After our meal, we grabbed a cab and made our way to La Boca. I knew in advance that this was a touristy area but did not care because we knew we could catch some music and tango dancers there. With our limited time in Buenos Aires, we would not have time to see a show before our ship departed. This seemed like the best option. As we exited the cab we caught the smell of charred meat in the air, the sounds of tango music and spotted a couple giving tango lessons outside a café. The atmosphere was festive but relaxed. La Boca is not overly crowded but definitely geared toward the tourists. Souvenir and small artisan shops are abundant. This is a good place to grab a seat in the shade and take it all in, the people, the music, the smells. La Boca is not terribly large. You probably would not spend more than a couple hours there but it is worth the trip. Because it is a tourist spot, taxis are readily available. With the end of our time in port nearing, we jumped in a cab back to our ship. Although we did not spend a lot of time in Buenos Aires it was enough to know it is a place we would return for a longer stay. That is really the most anyone can expect from a day trip to a large city. So, between getting in everything we wanted to do and knowing we will return I think we made the most of our time in Buenos Aires. The cruise port is not the Puerto Madero. It is approximately a 5 to 10-minute taxi ride. You can walk it but allow enough time. Be careful with taxis in La Boca. Make sure the meter is running or you have negotiated the price in advance. If you are looking for more things to do in Buenos Aires check out 52 Reason to Visit Buenos Aires.